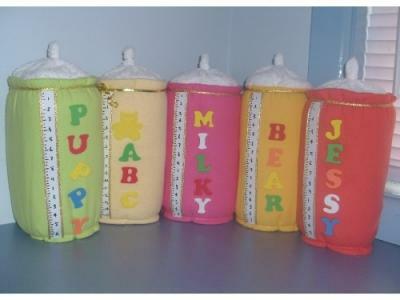 Check out these adorable baby blanket bottles sent in by our reader Vanessa! So cute. I love the fun colors she used. Can you believe it is made out of receiving blankets and disposable diapers? What a great craft idea. Thanks for sharing it with us Vanessa! It turned out so cute! Here are pictures of the baby bottles I have made. They look great as decoration for a baby shower, and are completely usable afterwards as they are made of disposable nappies and baby flannel blanket. I can't tell you how I make them as I sell the pattern, but thought you would like the picture to use on your site.